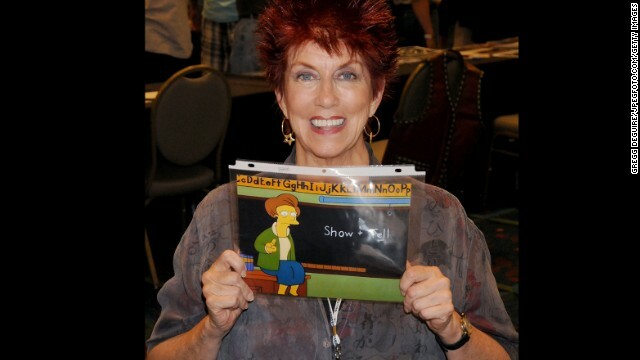 On Sunday, "The Simpsons" found a subtle but poignant way to pay tribute to the late Marcia Wallace. The Emmy-winning actress was the voice of Bart Simpson's teacher, Edna Krabappel, since the animated Fox show began in 1990. When Wallace died at age 70 last month, "Simpsons" executive producer Al Jean said they would retire her character. And on November 3, Bart Simpson was the one who got to say goodbye. Instead of his usual scribbles that fill up the classroom chalkboard in the "Simpsons" opening sequence, Bart was seen writing just one sentence: "We'll really miss you Mrs. K."
In addition to her work on "The Simpsons," Wallace was known for her character Carol Kester on "The Bob Newhart Show." « Previous entryKerry Washington hosts 'SNL': How'd she do? She was my favorite teacher for 25 years. Look how sad Bart is?? I got slightly chocked up. Thanks for all the laughs! !